This scent of Dr B soaps is great for when you're ill. I love putting a bit in a hot bath. Soothing and refreshing naturally! 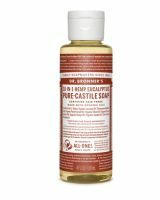 It also washes off nice and clean and is great for anyone who wants to make their own house cleansers. I know that the 12-in-1 soap thing is not exactly true. This makes a terrible mouthwash, isn't that great for washing clothes and while I use it to wash my face when I'...read morem camping it won't replace my face wash in everyday life. Still it is quite versatile and won't inspire any eco-guilt. Love it!